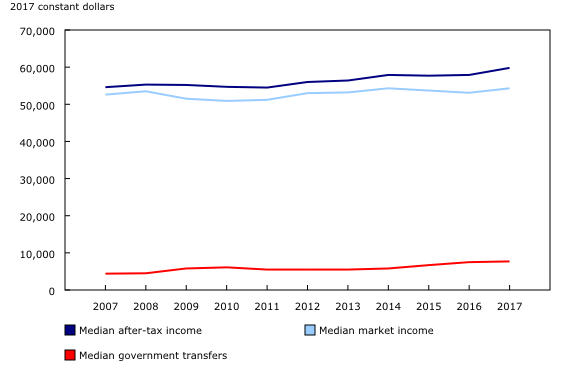 Median after-tax income of Canadian families and unattached individuals rose 3.3% to $59,800 in 2017, following two years without growth. This gain was the result of a combination of factors, including higher wages and salaries among non-senior families (where the highest income earner was less than 65 years of age), and an increase in child benefits. In 2018, the Canadian government set the Market Basket Measure (MBM) as Canada's first Official Poverty Line. The share of the population living below Canada's Official Poverty Line, fell from 10.6% in 2016 to 9.5% in 2017. The median market income of non-senior families rose 2.7% from 2016 to $92,400 in 2017. The gain in market income was due mainly to an increase in annual wages and salaries income, which reached $85,500 for non-senior families, and reflected the stronger employment growth in 2017. In addition, 2017 represented the first full calendar year of implementation for the new Canada Child Benefit (CCB), which came into effect in mid-2016. The CCB, which bundled together and enhanced previous federal child benefit programs, resulted in higher incomes for families with children. Couple families with children saw their median child benefits increase by $1,200, while lone-parent families received an extra $1,300 in 2017 compared with 2016. Overall, these changes combined to raise the median after-tax income of non-senior families by $1,500 to $87,600 in 2017. The median after-tax income of senior families (where the highest income earner was 65 years of age and older) totalled $61,200 in 2017, up $2,500 from 2016. The median after-tax income of senior families has trended up steadily since 2012, reflecting increases from wages and salaries income and private retirement income. In August 2018, the Canadian government released Opportunity for All: Canada's First Poverty Reduction Strategy. This was followed in November 2018 by the tabling of new legislation (Bill C-87) in Parliament that would, if passed, set the "Market Basket Measure" (MBM) as Canada's first Official Poverty Line. For more information regarding Canada's Official Poverty Line, refer to Opportunity for All: Canada's First Poverty Reduction Strategy. Fewer Canadians lived below Canada's Official Poverty Line in 2017, as measured by the MBM. According to the MBM, a family lives in poverty if it does not have enough income to purchase a specific basket of goods and services in its community. In 2017, 3.4 million Canadians, or 9.5% of the population, lived below the poverty line, down from 10.6% in 2016. In 2017, 622,000 children under 18 years of age, or 9.0%, lived below the poverty line, down from 11.0% (755,000 children) in 2016. The child poverty rate, according to the MBM, has declined fairly steadily since reaching its most recent peak of 15.0% (1.0 million children) in 2012. There were 238,000 (3.9%) seniors living in poverty in 2017, down from 284,000 (4.9%) in 2016. This decline was concentrated among unattached seniors, where the poverty rate fell from 11.0% in 2016 to 8.4% in 2017. People in lone-parent families recorded among the largest decreases in poverty in 2017—the proportion of people in these families living below the Official Poverty Line fell from 29.2% in 2016 to 22.7% in 2017. The poverty rate for persons in lone-parent families has been declining steadily over the previous five years, associated with increases in child benefits. Statistics Canada also reports low income based on the Low Income Measure (LIM). The LIM, along with the MBM, is reported as an indicator for the United Nation's Sustainable Development Goals. According to the LIM, individuals live in low income if their household after-tax income falls below half of the median after-tax income, adjusting for household size. Like the MBM, the LIM has trended down since 2015. However, at 12.7% overall, the rate in 2017 was not significantly different from the rate of 13.0% in 2016. The LIM rate for children, however, was significantly lower in 2017 at 12.1%, down 1.9 percentage points from 2016. The LIM rate for people aged 65 and older has increased in recent years, rising from 12.2% in 2012 to 15.4% in 2017. This increase contrasts with the falling MBM rate for seniors, reflecting differences in the way the two measures calculate low income (see "Why are trends in the Market Basket Measure sometimes different from trends in the Low Income Measure?"). Why are trends in the Market Basket Measure sometimes different from trends in the Low Income Measure? Trends in the Market Basket Measure (MBM) and Low Income Measure (LIM) rates sometimes differ. This is due to differences in the way the two measures calculate low income. The MBM is based on the concept of an individual or family not having enough income to afford the cost of a basket of goods and services. Therefore, when the incomes of lower income people rise, the MBM rate tends to fall, because more people can afford this basket of goods. The LIM is based on the concept of an individual or family having a low income relative to the Canada-wide median. In general, for the LIM rate to fall, the income gap between lower income people and other people has to narrow. It is often good to consider both indicators for a more complete picture of low-income trends in Canada. For example, a decline in the MBM rate for seniors shows that the income levels of lower income seniors has improved, but an increase in their LIM rate shows that the income gap between lower income seniors and other Canadians is getting wider. To provide an overview of the distribution of after-tax income in Canada, families and unattached individuals were divided into 10 equal-sized groups, or deciles, from the lowest to highest in after-tax income. Canadian families and unattached individuals needed to have an after-tax income of more than $142,100 to be in the top decile in 2017. The average after-tax income in the highest decile was $201,400. Families and unattached individuals with after-tax income of less than $19,100 were in the lowest decile in 2017. Average after-tax income in the lowest decile was $10,500. Tracking the shares of income held by the different income deciles can help shed light on income inequality in Canada. For statistics on income inequality, it is common practice to use income measures based on after-tax household income that has been adjusted for household size (adjusted after-tax income). Based on adjusted after-tax income, Canadians in the highest decile accounted for 23.3% of total after-tax income in Canada in 2017, while the lowest four deciles (the bottom 40% of the population) represented 20.4%. One of the Sustainable Development Goals (10.1) is "to reduce inequality and progressively achieve and sustain income growth of the bottom 40% of the population at a rate higher than the national average." From 2016 to 2017, adjusted household after-tax income rose by 2.7% for people in the bottom 40% of the income distribution, while it was up 3.1% for the population as a whole—rates that were not significantly different from one another. Over the last five years, the growth rate was 8.1% for those in the bottom 40%, while it was 6.0% for all Canadians. This is consistent with the finding reported by the United Nations that from 2010 to 2016, the incomes of the bottom 40% of the population grew faster than those of the entire population in 60 out of 94 countries. Families and unattached individuals in Alberta ($70,300) had the highest median after-tax income in 2017. Nova Scotia had the lowest, at $50,200. British Columbia (+7.6%), Quebec (+4.2%) and Ontario (+4.0%) all reported increases in their median after-tax income compared with 2016. There was little change among the other provinces. On January 1, 2016, the world officially began implementation of the 2030 Agenda for Sustainable Development—the United Nations' transformative plan of action that addresses urgent global challenges over the next 15 years. The plan is based on 17 specific sustainable development goals, 169 targets and 244 indicators. Statistics Canada strives to continually improve the quality of the estimates from the Canadian Income Survey. For example, the 2017 Canadian Income Survey is based upon a sample size that is about 50% larger than in previous years, improving the precision of the income estimates. In addition, this release of the Canadian Income Survey is available two weeks earlier than the 2016 cycle, and 15 weeks earlier than the 2015 cycle. In this release, differences between estimates are statistically significant at the 95% confidence level unless otherwise noted. An economic family refers to a group of two or more persons who live in the same dwelling and are related to each other by blood, marriage, common-law, adoption or a foster relationship. This concept differs from the census family concept used for sub-provincial data in the Annual Income Estimates for Census Families and Individuals. Senior families refer to families where the highest income earner is 65 years of age and older. Non-senior families refer to families where the highest income earner is less than 65 years old. This release analyses income on the basis of medians. The median is the level of income at which half the population had higher income and half had lower. Dollar estimates are expressed in 2017 constant dollars to factor in inflation and enable comparisons across time in real terms. Government transfers include benefits such as Old Age Security, Guaranteed Income Supplement, Canada and Quebec Pension Plan, Employment Insurance, Social Assistance, Goods and Services Tax Credit, provincial tax credits and various types of child benefits. Income inequality refers to the extent that income is distributed unequally among members of a population. While there are different ways to describe income inequality, this analysis reports on the share of adjusted after-tax income held by various segments of the income distribution. For more information on Sustainable Development Goal 10.1 please refer to The Sustainable Development Goals Report. Adjusted after-tax income. For statistics on income inequality, it is common practice to use income measures based on after-tax household income that has been adjusted for household size (adjusted after-tax income). Adjusting for household size allows users to compare the income of households of different sizes. The adjustment is made by dividing household income by the square root of the household size and assigning this value to all persons in the household. This adjustment distributes income among the members of the household, and takes into account the economies of scale present in larger households, the increasing number of people living on their own and the decline in family size over time. Adjusted after-tax income is also used in the calculation of the Low Income Measure. The Low Income Measure (LIM) defines an individual as having low income if their adjusted after-tax income falls below 50% of the median adjusted after-tax income. The Market Basket Measure (MBM) is based on the cost of a specific basket of goods and services representing a modest, basic standard of living. It includes the costs of food, clothing, footwear, transportation, shelter and other expenses for a reference family. These costs are compared to disposable income of families to determine whether or not they fall below the poverty line. The MBM was originally designed in the early 2000s. From 2008 to 2010, the "first comprehensive review" updated the MBM methodology. In 2019, changes were made to this methodology. For more information, please refer to "Methodological changes to the Market Basket Measure in 2019." Recently, Statistics Canada began a "second comprehensive review" of the MBM to ensure that it remains an accurate measure of low income. During the comprehensive review, Statistics Canada will engage in several consultation activities, conduct research, and update where necessary the methodology of the MBM. The results of the comprehensive review will be published in 2020. The infographic "The income of Canadians, 2017," which is part of Statistics Canada — Infographics (Catalogue number11-627-M), is now available. The report "Methodological changes to the Market Basket Measure in 2019," which is published as part of the Income Research Paper Series (Catalogue number75F0002M), is also now available.